Home-made vanilla extract & home-made sherry vanilla extract! Recipe: For 2 different vanilla extracts! 1 cup of a good sherry, I used Domeq, Dry fino sherry/ All distilled alcohols are gluten-free! First, sterilize your pots where you will keep your vanilla beans & liquid in, also the lids. Do this 1 cycle in your dishwasher or boil the pot & fitted lids for 10 minutes into boiling water, drain them well but do not touch the interiors! 2. For the sherry vanilla extract: the same way. You can find many tasty recipes here on my blog, where I use vanilla extract in, like Sophie’s vegan & Gluten-Free granola or but not yet where I use my sherry vanilla extract. I think it will be great in cakes, in muffins or waffle batters, in berry sauces with a hint of sherry vanilla,..I will be thinking of more uses like this,…I will keep you all posted about my inventions! 😉 ♥ Stay Tuned & subscribe by email! Join 1,800 email subscribers now!!! It is free!!!! Click the link here below to subscribe!!! 4. Vegan pumpkin carob brownies using sherry vanilla extract! Next Post Licor 43 marinated kakis ricotta dessert! That is a long time! I’ll just have to be patient hehe. I’ve just bought two large bottles of vodka as I’m making vanilla extract as Christmas presents. And lol, I just used a bunch in crabapple liqueur and the cocktail I posted last night. Seems we’re all thinking vodka. As always, love your packaging. Wish I could have you help me package and label my vanilla extract gifts. Yreahhhh! That is why I made it 1 moth before because my older vanilla extract was used up! I make my own vanilla (necessity as well as frugal) but love the idea of sherry vanilla too. 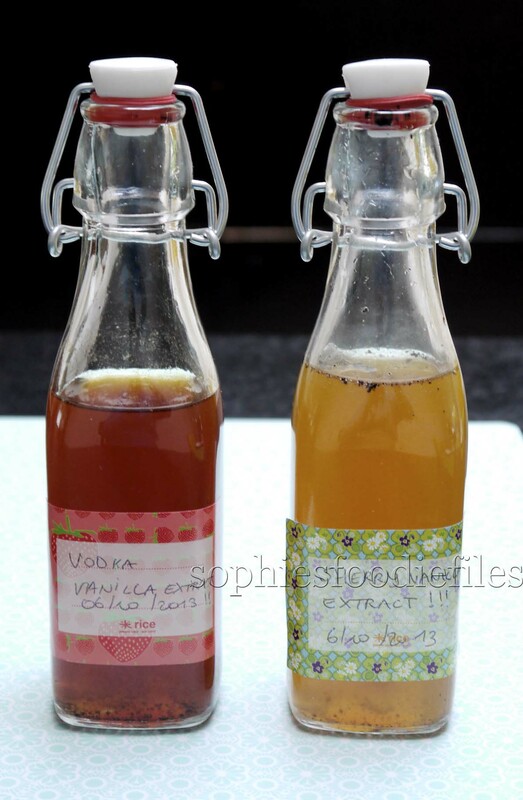 Great idea Sophie…homemade vanilla extract. Yes, they sure make a nice gift. Great idea, Adrian & why not add vanilla beans & raspberries together or blueberries, some sugar & vanilla with vodka? Darling Sophie, have you already started making Holiday gifts? How lovely! Good vanilla extracts are so~ expensive and this post is so valuable. Lovely Sophie! We make our own vanilla extract in this way as well – a couple of our bottles are now quite old, and the aroma is magnificent! Vodka and vanilla together? You are speaking my language Sophie! Great Christmas present idea. I’ve seen it made with Bourbon, but never vodka. Sounds lovely! I don’t know, I think it is too strong to drink. I think it is too sprong just too drink? Those came out gorgeous! I love the cute bottles. They will make stunning gifts. What happens to the vodka alcohol content? Does it still remain alcoholic and what should I use this for? Thanks for sharing! I think it stays a bit into the vanilla extract but in every recipe you only use 1 teaspoon or so & I haven’t felt bizarr,… 😃😃 this is how you make vanilla extract at home & I use it in many dessert or breakfast recipes like mentioned above. Thanks. I shall make some when I get some vanilla pods. Can I use it for baking as well? It never occurred to me to make my own extracts, Sophie. What a marvelous idea. And sherry vanilla extract? Sounds divine! Beautiful, Sophie! More wonderful homemade gifts from you – – and good ideas for us!! Fantastic idea, you sure think and plan way ahead. The problem I would have is to remember to shake the bottles every day. The sherry-vanilla one sounds amazing. And just look at the color. Definitely a perfect hostess gift for the holidays. These look very interesting. I’ve never tried to make my own, but it would probably taste pretty good 🙂 Thanks for sharing! They do,..they are also easy to make! I am putting it on my to-do list! Brilliant post for the weekend, I’ve always wanted to make my own vanilla extract since most of them are so expensive these days. And a good vodka is fabulous! The bottles are cute! That is really cool that you made your own vanilla extract! I love the different ways you approached it. Thank you for this tutorial Sophie! This sounds like a super tasty little project…I will definitely be trying this!! What a great gift it would make for Christmas, too!! PS…I didn’t know Smirnoff was gluten free- score!! Homemade vanilla extracts are so surprisingly easy and makes a great holiday gift! This is such a great idea, thanks. Will make great Christmas gifts. So fun! Would love to take this along to gift to friends who have us for dinner. I’ll have to look for some cute little bottles. thanks Sophie!